Southern East Anglia Southern East Anglia U-Pick farms: Find a pick your own farm near you in Southern East Anglia for fruit, vegetables, organic foods, pumpkins, local produce and more! Looking for a local, pick-your-own farm in Southern East Anglia? Scroll down this page and you will see the U-Pick farms in Southern East Anglia, sorted by county. Those that offer organic or sustainably grown produce are identified by the words "organic" and/or "sustainable" in Green, next to their name . The U-pick crops they offer follow the name of the farm. To search the page for a specific crop, use Ctrl-F (or on an ipad or Mac, use their "search on this page" function) If they have a website, the name will be in blue and underlined; click on it and it will open their website. Beware of copycat websites (such as the one that starts with "pickit" and the one that ends with ".farms"; they do not update their information, they just steal it from us once in a great while (they are plagiarists operating in Russia and China), so theirs are usually out-of-date -and often copied incorrectly! I put dates to indicate when we last received an update from each farm, and I make updates daily (each farm as their info changes). See the customer and farmer menus at the top menu bar to submit updates and corrections and help me keep each current! Grove Farm PYO - over 30 different fruits and vegetables during the season. Cramps Farm - I haven't yet found out what they have; write to me, if you know! Little Wakering Road, Great Wakering, Southend-On-Sea, Essex SS3 0LG. Phone: 01702 219314. A visitor writes: "Extremely friendly owners, very tidy picking areas, suitable for children, tea room available in afternoon, best to phone to see what is selling, information updated daily." Hilltop Farm - They have some PYO - but I haven't heard just what! Hilltop Avenue, Benfleet, Essex SS7 1PH. Phone: Phone: 01268 752734. Little Baddow Hall Fruit Farms Ltd - plums and Christmas trees. Mill Farm Strawberries - UPDATE for 2018 - Permanently closed - As some of you are aware this has been our last proper season growing and selling strawberries after 40 years in the business. We would sincerely like to thank those of you who have supported us over this time, especially our regular local customers. Many families have said it is indeed the end of an era. Spencers Farm Shop - Wickham Fruit Farm - Strawberries, Raspberries, Gooseberries, Red & Blackcurrants, Blackberries, Loganberries, Cherries, Plums, 18 Varieties of Apples Asparagus, Runner Beans, Courgettes, Pumpkins. Wickham St Pauls, Halstead, CO9 2PX. Phone: 01787 269476. Fax: 01787 269476. Email: info@spencersfarmshop.co.uk. Open: See their website for hours. Directions:Directions and map. 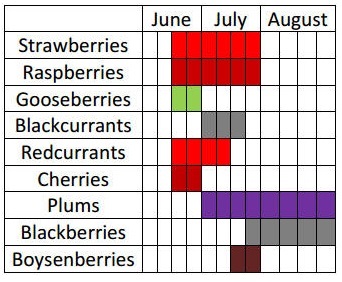 Strawberries, Raspberries, Gooseberries, Red & Blackcurrants, Blackberries, Loganberries, Tayberries, Cherries, Plums, 18 Varieties of Apples Asparagus, Runner Beans, Courgettes, Pumpkins.Since first growing "Pick Your Own" fruit in 1973, our range of PYO fruit and vegetables has grown considerably. We are particularly proud of our "Table Top Strawberries" grown at waist height for ease of picking! If you would like to pick your own, simply call in at the shop (opening times here), but feel free to phone us on (UK) 01787 269 476, or email us if you have any queries. . Click here for a link to our Facebook page. Availability Jan / Feb/Mar April May June July August Sept. Oct. Nov. Dec.